The development of TrueCrypt, the free disk encryption software had stopped, but the open source community called IDRIX kept it alive by launching VeraCrypt. On 13th February, the 13th update for the VeraCrypt file encryption software was unleashed. The performance of the latest VeraCrypt 1.17 software is better than its earlier version (v1.16). Now the user will experience faster booting and mount speed. VC 1.17 includes a new GUI features. It now lets you create and format exFAT partitions. VeraCrypt features an improved Whirlpool algorithm implementation that results in better performance. The developer claims that the optimized WhirlPool increases the application’s speed by 24.9 percent. VeraCrypt now allows you to set complex passwords with Unicode characters. The user will find the changes mentioned above in VeraCrypt for Windows, Mac, and Linux OS. Apart from the changes, several bugs have been fixed in VC. To get more details on the fixed errors and issues, please go through the official changelog. How to use this free encryption software (true crypt alternative)? VC software supports all major operating systems. To get started, visit its official website, download and run the free software. VeraCrypt allows you to create virtual encrypted disk within a file. According to the software, this option should be selected by the inexperienced or newbie users. If you’re an advanced user, you can select the create a volume within an existing partition option which formats the entire partition and encrypts it with a selected algorithm. The user can create a hidden or standard veracrypt volume. He is also allowed to select a file. While creating an encrypted partition, you’ll be asked to choose an encryption and a hash algorithm. You’ll also be prompted to specify a file system type and enter passwords for accessing the data. Depending on the read/write speed of the storage hardware and the size of the partition, the software may take a time to format and encrypt the selected partition. 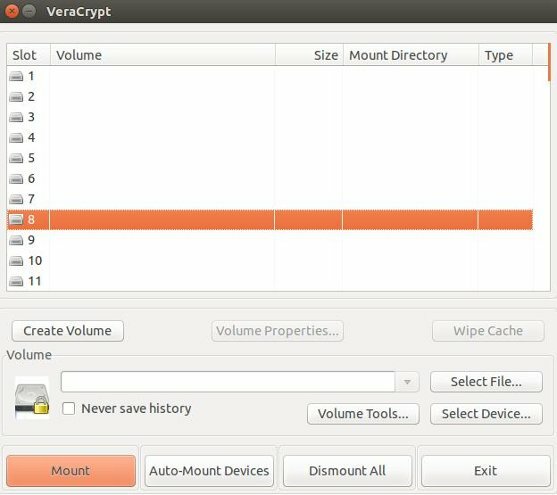 When a volume has been created, VeraCrypt can mount or unmount it. It can also make you aware of its details. While mounting, you’ll be asked to enter the password. If you enter incorrect login credentials, you’ll not be able to access the data. If you’ve created a lot of VC volumes, the software has auto-mount devices and unmount all options for a better experience. Have you used the 1.17 version of this free encryption software? How to mount Linux partition in Windows OS?